Association of America (HLAA) held in Minneapolis, Minnesota in June, 2018. Webmaster, Janet Haines, was honored with the crystal award pictured below. The Awards Ceremony was held on Wednesday, June 20th, in the Mirage Room of the Minneapolis Hyatt Regency. Dave Hutcheson, Editor-in-Chief of Hearing Life magazine, presented the award after praising the excellence, dedication and hard work of volunteers who, like Ms. Haines, contribute to strengthen the HLAA organization and family. 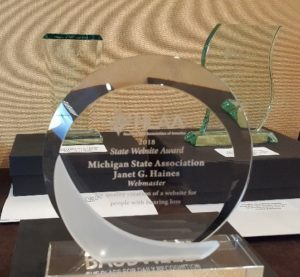 Janet Haines has been the Webmaster for the HLAA-MSA website since 1999. She first became involved in the Michigan organization of HLAA in 1998 and has served the organization at the local, state and national levels. She lives in Holland, Michigan and enjoys traveling, time spent with family as well as expressing her talents through beautifully crafted quilting projects.